Fundraiser by L.E.A.N. 4 Jesus Ministries : Backpacks 4 FREE! “Backpacks 4 FREE” was inspired by a vision our ministry received from the Holy Spirit. In mid-2016, we began to fulfill this vision, and our ministry purchased drawstring backpacks. 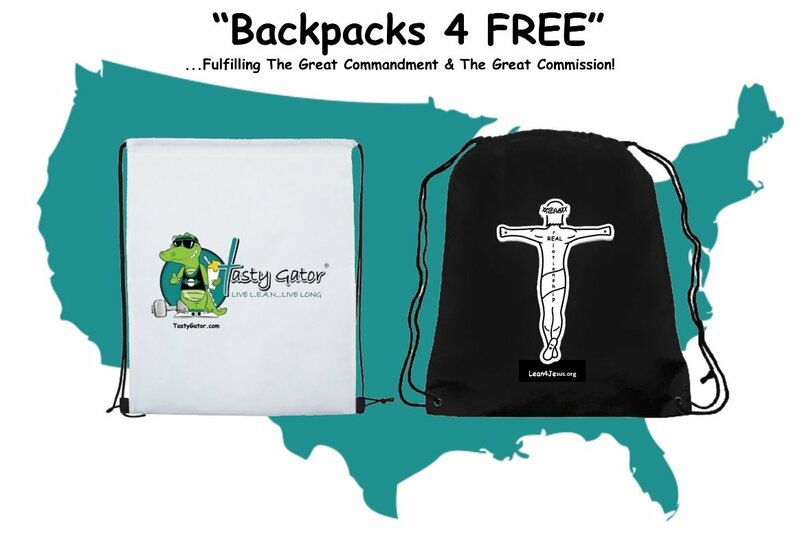 There are (2) backpacks that are given: a “Tasty Gator” backpack with the colorful gator logo, and the “REAL-ationship” backpack, which displays the backside of Jesus’ body and the message of having a REAL-ationship (a real relationship) with Him. The Lord told us to take dozens of these backpacks, and give them out for free at the various conventions we attended. We continued to be blown away by the reaction that we received from so many who truly appreciated the fact that we cared that their hands were full, or that they looked tired and could use a backpack, and/or that we just wanted to give them something for free….without “a catch”…a common response because of the world in which we live. Through our many experiences attending these events, we have come to realize that giving these free backpacks (backed by genuine expressions of love) actually makes a silent statement about the love of Jesus, and His saving grace, which also comes without a catch and/or a price tag. We have found that many are starved for others to take genuine interest in them without hidden motives or agendas, despite their beliefs, personal lifestyle choices, and etc. Basically, people just want to be genuinely loved and accepted for who they are. We remain grateful to freely love on those who want to be loved, and offer guidance for those seeking direction in regards to Jesus. We know that this initiative is making a difference, because when people would leave our table, they left with a smile and, oftentimes, a hug. They also left with the message of salvation (based on Romans 10:9), which was stuffed into each backpack. Attending events with these backpacks has helped to break through barriers, which is especially helpful for those who seem hesitant to approach a table that has the message of salvation displayed. These backpacks have helped create more one-on-one personal interaction, and have opened up many opportunities to share the love of Jesus. We have embraced that it is with every interaction that we have with the hundreds/thousands who cross our path at these events that we are given priceless moments to make a (positive) memorable experience. Because when they remember that, they remember Jesus. This is the true essence of ministry. These are the brief moments of impact that can change someone’s life. Jesus does not need much to plant tiny seeds in the hearts of others, and from what we have experienced, we believe several people have given their lives to Jesus Christ through our interaction with them. It is our goal that wherever we travel, we seek to make the Great Commandment (through Matthew 22:37-40 and 1 John 3:23) come alive! Our ministry recognizes the seriousness of the fact that EVERY person who crosses our path, matters, and it is our duty to let them feel this from us within whatever time period we are given to make a difference in their day (and possibly in their life). Whether it’s in hugs, smiles, words of positive encouragement, prayer, or possibly messages from the Lord, we are ready to be the living extension(s) of Jesus Christ for that person! We seek to deliver no less than this, because we recognize that Jesus chose us for each mission in which we are sent so that we can shine His light on anyone who needs it, and even on those who don’t believe they do. Because of our previous experience at these events, the vision we have been given has now expanded to traveling the nation to attend events and conventions (of all kinds). Wherever the Lord leads, there we will be out of obedience and love for Him. Aside from fulfilling the Lord’s Greatest Command (Matthew 22:37-40 and 1 John 3:23), the Lord has now given the vision to fulfill The Great Commission (Matthew 28:19-20) through the “Backpacks 4 FREE” initiative. We are able to do this by preparing and giving out FREE Discipleship Kits. For those who are ready to embrace a REAL-ationship with Jesus Christ, as well as a life of discipleship, their salvation is verified (based on Romans 10:9) and a baptism performed somewhere in the immediate area (ie hotel pool, lake/river/ocean, etc.) to ensure that John 3:5 has been fulfilled. That person receives a Discipleship Kit that consists of: a “REAL-ationship” backpack, a 1-year NIV Holy Bible, a re-birth certificate (to document when they were re-born of both water and Spirit), a REAL-ationship baptism t-shirt, a towel (to use for their baptism), a L.E.A.N.letter ministry teaching message about having a REAL-ationship with Jesus Christ (backed by Scripture), and baptism instructions (for when that person performs their own baptisms). This Discipleship Kit also serves as a helpful template and a teaching tool to demonstrate what this new disciple can do when preparing others for their life of discipleship. “Backpacks 4 FREE” is also meant to demonstrate and inspire others within the body of Christ that these Great initiatives can be fulfilled anywhere, anytime, and by any disciple of Jesus Christ. This is especially true as it pertains to baptisms, since as mentioned above, we attend each event prepared with a venue (a pool, lake/ocean) to baptize when given the opportunity to do so. We are ready to make this initiative go full-force starting with 2 events/month. So, funding is needed right away! Jesus has opened this door for us, and we are walking through it. We are confident that He will provide that in which we need to accomplish this mission to advance His Kingdom. For those who lend their support will also be a part of this journey with us. Coupled with the grace of Jesus Christ, YOU are making the way possible. Please know that it will be those who help give us a way, who will also give a way to others to come to know Jesus! Thank YOU for your support! L.E.A.N. 4 Jesus Ministries is a spiritual health and wellness traveling ministry and a 501 c3 non-profit organization. It is our belief that when we L.E.A.N. (Love Everyone As Neighbors), which is based on the Greatest Commandment (Matthew 22:37-40) we are properly equipped to effectively bring forth our mission: To save one life at a time by eliminating unnecessary confusion and distraction of the world (spiritual obesity). As spiritual warfare heightens, so is worldly confusion and distraction that is preventing the proper message of salvation from being spoken/taught (based on Romans 10:9), delaying/preventing (full) spiritual transformation, and is hindering personal, intimate relationships with Jesus Christ from transpiring. These areas of concern, amongst others, are advancing this epidemic within the body of Christ. Our ministry is based on Truth, and nothing else! Like Jesus, L.E.A.N. 4 Jesus Ministries is here to separate, and to be the power of one. The separation is meant to make a distinction in several areas in order to eliminate spiritual obesity so that the body of Christ can overcome the limitations of the human flesh and transform into the likeness of Christ. In order to overcome this, consistency is key…consistently living a life of obedience to God’s Word through the Holy Bible as well as personal instruction given by the Holy Spirit; consistently living the Greatest Commandment (without exception); consistently walking the walk that matches one’s talk; consistently eliminating unnecessary distractions of the world (spiritual obesity) that entertains more use of the mind versus more use of the spiritual heart; consistently living in power in the kingdom of God through the aid of Jesus Christ’s name in order to live a life of victory versus one of defeat; consistently displaying a committed (and living) REAL-ationship with Jesus Christ through a life of discipleship; consistently displaying on-site prayer as well as spiritual gifting to glorify the name of Jesus Christ; and consistently living life in the miraculous spiritual realm in the kingdom of God (here on earth)where the impossible is made possible! From our online Spirit-inspired teachings/messages currently reaching over 20 US states and 62 cities, and 30 countries, to our one-on-one interaction with those whom we come in contact with, we are focused on making a difference in Jesus Christ’s name! We are serious about spreading the Truth and love of Jesus Christ EVERYWHERE and in EVERY WAY possible. As Jesus said, “Do EVERY word and deed in my name” (Colossians 3:17), and we are taking our Lord’s instruction with a great level of seriousness, and making this happen!